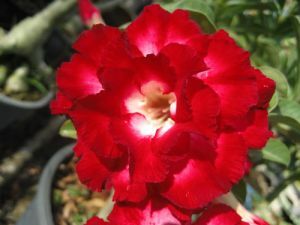 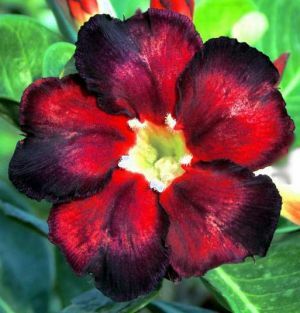 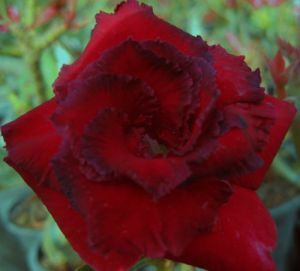 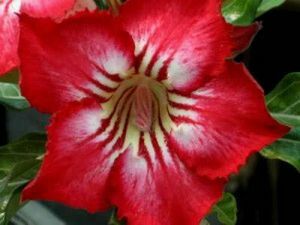 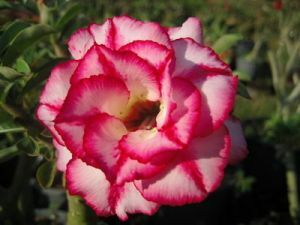 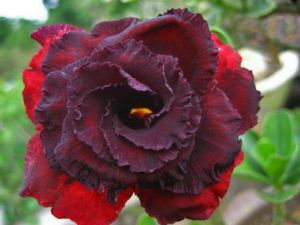 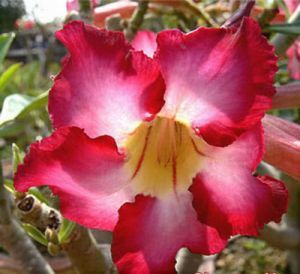 The genus Adenium, German called Desert Rose, found in Africa and the Arabian peninsulas and are, like the Plumerien (frangipani) and others in the family of the Apocynacae (dogabane family). 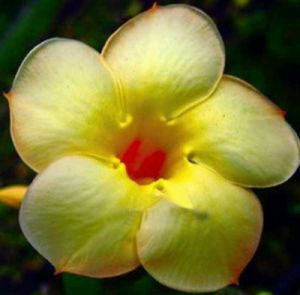 However, the distribution is both in Asia and in South-East Asia, where all breeding farms in this genus have arisen. 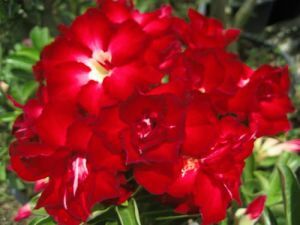 These succulent plants are Xerophytes (i.e. 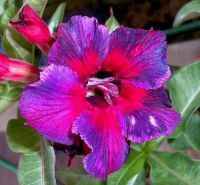 they can survive in areas where little water available to them) and form a thickened, water base for root (Caudex), through which they are able to survive long periods of drought in over the years. 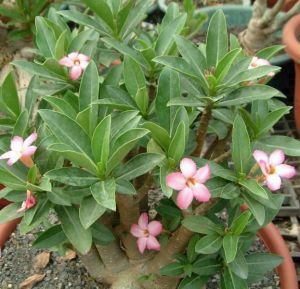 The plants are shrub or tree-shaped most with spiral, elliptic, lanceolate, linearisch, spathulate-shaped or also obovate, dark green leaves with midrib often lighter and venation, but there are also varieties with variegated leaves. 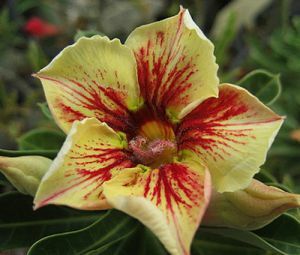 The flowers appear mostly in the leafless time in dense clusters at the end of the shoots. 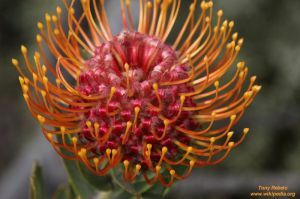 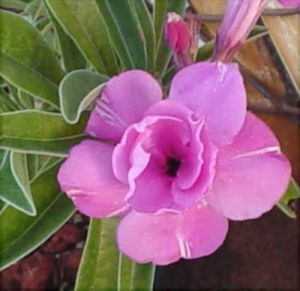 Each individual flower has 5 petals, which slightly roundish, elliptic, lanceolate, with wavy edges or they are overlapping or star-shaped arranged. 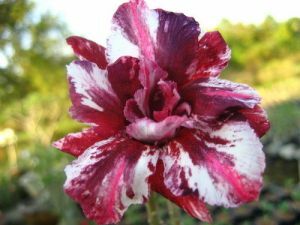 The color ranges from white, yellow, pink, red, pink of striped, marbled or fitted with a differently colored border (picotee). 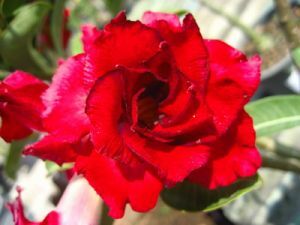 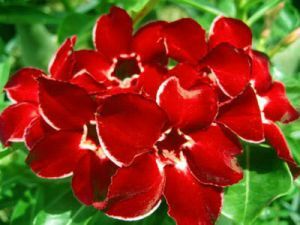 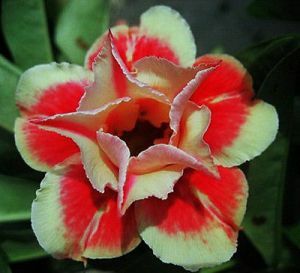 The sap of Adenium plants is toxic, in some species, it is used as an arrow poison. 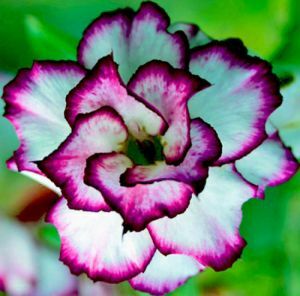 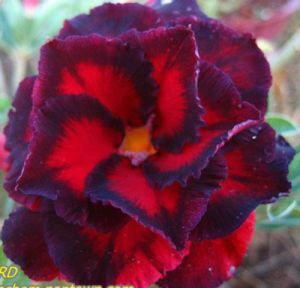 Colour and form is not always the same as that of the mother plants in seedling plants. 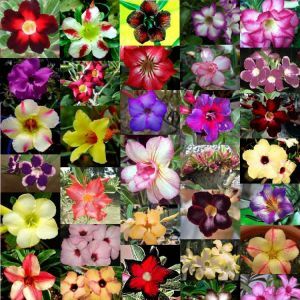 It is quite possible that the new flowers have a slightly different color spectrum, what possibly to new varieties inspired!